Meticulous Matte Auto Wash is the perfect detailing shampoo to wash your matte paint, vinyl or wrapped exterior finishes. Owners of matte, or flat paint know all to well that taking care of it can be a pain. This type of paint normally has a coating on it but its very thin and porous so you need to be very careful and make sure you are not using the wrong kind of product. That means in general you can not use waxes, sealants, gloss enhancing quick detailers, polishes and shampoos with protection in them. Meticulous Matte Auto Wash is formulated with unique cleaning polymers and citrus extracts that allow for zero streaks and the easy removal of dirt and road grime from the surface. Simply mix 1 oz. of Meticulous Matte Auto Wash to 4-5 gallons of water to create a superior shampoo with a generous amount of wash suds. The advanced super polymers will glide over any exterior surface so your car, truck, motorcycle, or RV stays protected against the elements. This makes it the perfect maintenance shampoo for not only Matte finishes, but absolutely any vehicle you have! If you are looking for the perfect shampoo for your matte finish vehicle then grab yourself a bottle of the Chemical Guys Meticulous Matte Auto Wash today! Auto Wash for Satin-Matte Finish is the latest innovation in detailing shampoo technology. 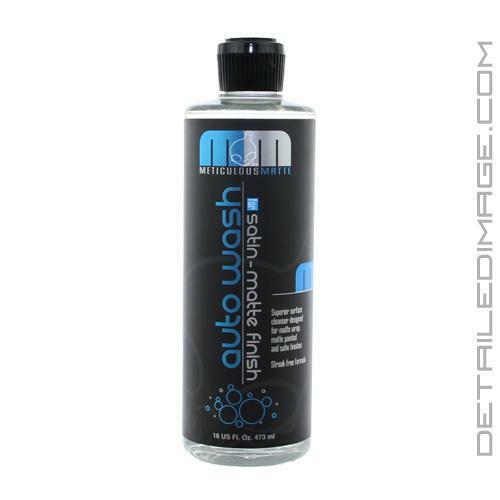 Auto Wash for Satin-Matte Finish is a strong superior cleaning shampoo that delivers remarkably amazing cleaning results through a consistent release of foaming bubbles. Auto Wash for Satin-Matte Finish is uniquely formulated with advanced foaming technology that works by suspending super polymers within each bubble allowing grime and built up dirt to be easily and effortlessly rinsed away. The unique lubricity of Auto Wash for Satin-Matte Finish loosens abrasive residue and allows it to be rinsed away without scratching the surface. The advanced foaming technology within the all purpose super foaming shampoo, Auto Wash for Satin-Matte Finish works specifically to remove grime, build up, and dirt consistent discharge of foaming bubbles. Auto Wash for Satin-Matte Finish turns your car into a foam party! Mix one cap full of product with one gallon of water in as clean wash bucket. I recently purchased a 2015 Camero that had a Matte finish on the engine hood only. I wasn't sure how to maintain this type of finish so I investigated that information on the internet. Found this product and have been using it for a month now. I really like the way the Matte finish looks. It looks better now than the day I purchased the vehicle.